Sword Warrior: Impressive. Not many people have the upper body strength to climb up 20 stories. Mizuki: Give back my gems! and even more impressive that you managed it all while keeping your muscles hidden. 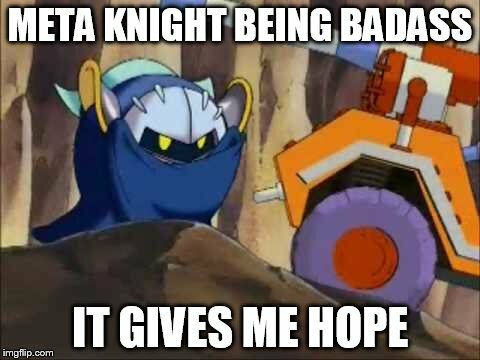 i like to imagine sword knight with meta knight's english voice from "kirby: right back at ya"
Good, because that's literally exactly what I was going for lmao. Make sure you have Adeleine and the chapter titles on there too! Still have a feeling we're in for a surprise or two! Mizuki's upper body strength is something to behold! Sword warrior (after seeing mizuki climb up 20 stories): Finally. A worthy opponent!! Nah, that's just an average evening for him!